Get your own band site? Did you sell over 100 CD's of your last release? Was this less than a year ago? Do you have another CD release in the next 2 months? Did you have unit sales of more than 200 CD's in the last year? Was you average song price USD $0.75 or more? Did you answer 'Yes' to all the above questions? Consider starting your own band site. With your sales, you should be able to pay for the site and may even boost sales. 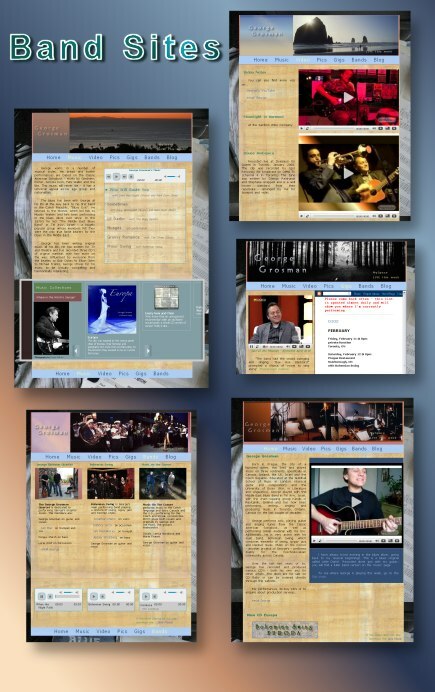 Bandsite web package - 5 pages; main, music, media, bio, news with a image gallery --- starting at $650. Your own domain + bandwidth --- $90/year. Budget for web updates starting --- $400/year. Emails on your domain, each --- $20/year. Flash animation template main page - $200. Add a Passcode Song Downloader to sell directly online and get all the profits - no profit share. A CD collection of up to 14 songs --- $550 each. Add a way for your fans to buy your songs using a 3rd party outlet --- $100 setup.